Leuco S.p.A.'s production range also includes piston pumps. For years, carrying the famous Hawk logo, it has been producing piston pumps with high technological content, placing the Reggio Emilia-based company at the top of the world pump producer league table. Hawk piston pumps are renowned for the technical quality and tightness of their components, which are produced following a strict manufacturing procedure. In producing piston pumps, the company pays great attention to the cylinder the piston runs in, as this must guarantee maximum tightness during the alternate movement which generates the pressure. For this and other reasons, Hawk has become a world leader in pump production. Indeed, for more than 30 years the Reggio Emilia-based company Leuco S.p.A. has been producing piston pumps for a range of different uses, from installation in high pressure water cleaners for industrial and civil applications, as well as self-service car wash systems, where a special pressure gun is fitted for car washing. 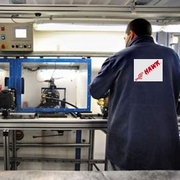 The wide range of piston pumps produced by Leuco S.p.A. and sold under the HAWK® brand includes more than seventy different models, which meet the growing need for differentiation expressed by customers in Italy and above all abroad, where quality and accuracy of the components used in the production of HAWK piston pumps contribute to their reputation as some of the best-performing pumps in the world.